With the assistance of Viridian, the Arkansas River Resource Center was recently awarded Silver level of certification through the U.S. Green Building Council’s (USGBC) Leadership in Energy and Environmental Design (LEED) green building program. “When the Little Rock Port Authority Board of Directors decided to build the new office building, it was important to raise the bar and set a precedent for our future. Sustainability is very important to this organization and it made sense to pursue a LEED rated building. We are excited and very proud of this accomplishment”, noted Chris Mathews, Little Rock Port Authority Board Chairman. The Arkansas River Resource Center is a 4,926 square foot, one story, office building located on 4.2 acres at the end of Industrial Harbor Drive on the banks of the Arkansas River. It is home to the Little Rock Port Authority and Shortline Railroad and features high-tech conference rooms and meeting spaces. The facility is designed to enable economic development, marketing, and educational activities related to the Little Rock Port Authority’s industrial park. The Port of Little Rock was established in 1959 by the city through state legislation. Adjacent to I-440, which connects I-30 and I-40, the Little Rock Port Authority is on the 448-mile McClellan-Kerr Arkansas River Navigation System, which runs from the Mississippi River northwest to Tulsa and the Port of Catoosa. Additionally, its location is approximately seven miles east of downtown Little Rock and less than one mile from Little Rock National Airport. 100% of occupied spaces provide exterior views and daylight. These features give building occupants a connection to the natural outdoor environment and reduce the use of electrical lighting by introducing daylight into the space. More than 27% reduction of potable water over a baseline modeled comparison due to efficient faucet, toilet, and urinal fixtures. There is an 85% reduction of potable water used for irrigation compared to a typical irrigation system. 34% energy efficiency improvement over a baseline modeled comparison to a similar building constructed to the energy efficiency standard of ASHRAE 90.1-2007. Of the materials used in construction: over 24% contained recycled content and over 22% were both extracted and manufactured from within 500 miles of the project site. Over 63% of the total construction waste generated was diverted away from landfills. 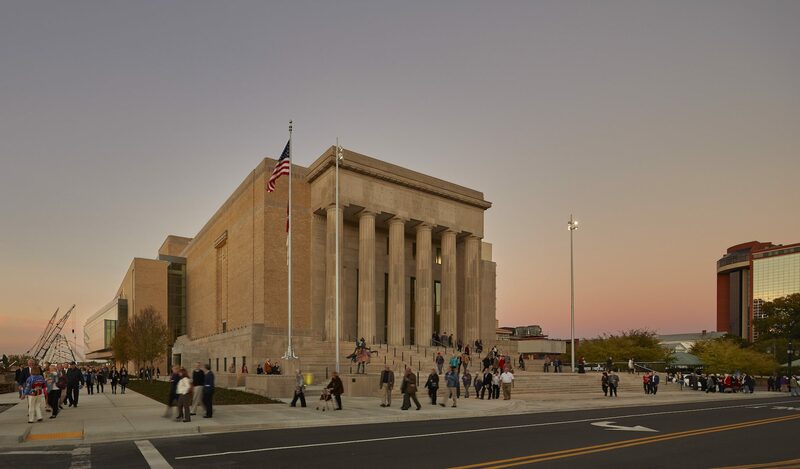 The Arkansas River Resource Center was designed by Jackson Brown Palculict Architects and constructed by Cline Construction Group. Viridian provided LEED Consulting, Fundamental Commissioning, and Energy Modeling services.